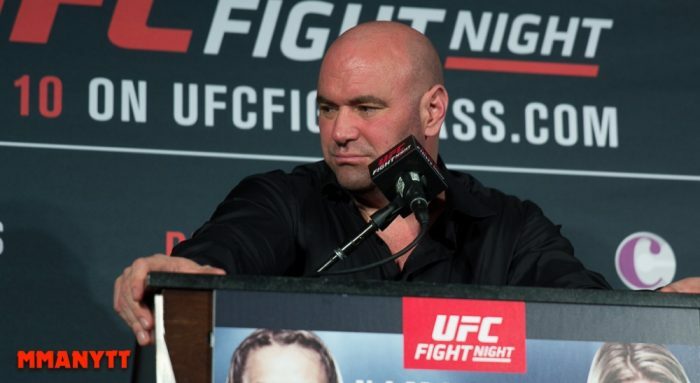 Dana White has no interest whatsoever in adding a 165-pound division to the UFC roster. On Thursday, the UFC president addressed rumors that the organization was considering adding the 165-pound weight class with plans in motion to eliminate the men’s 125-pound division to make room. While it appears the writing is on the wall about the future of the men’s flyweight division, White says that there is no truth whatsoever to the notion that he’s considering the addition of the 165-pound weight class now or in the future. Rumors had started this past week when former UFC fighter and current Bellator competitor Josh Thomson mentioned on Twitter that the promotion was planning to drop the flyweights and add the 165-pound division in its place. White adamantly denied that was going to happen as he’s done any time the conversation about a 165-pound division comes up. “Absolutely false, not true,” White said responding to those rumors. Numerous fighters have advocated for the addition of a 165-pound weight class including Dusin Poirier, Nate Diaz, Ben Askren and Kevin Lee. As much as the fighters might want it, White says it’s not going to happen now or any time into the future.